After two years of planning and work by dozens of community leaders in the public and private sectors, a new regional economic development organization (EDO) will soon launch in northern Michigan. Grand Traverse County’s Economic Development Corporation – an 11-member government board appointed by county commissioners – is partnering with TraverseCONNECT, parent organization of the Traverse City Area Chamber of Commerce, to launch the effort. 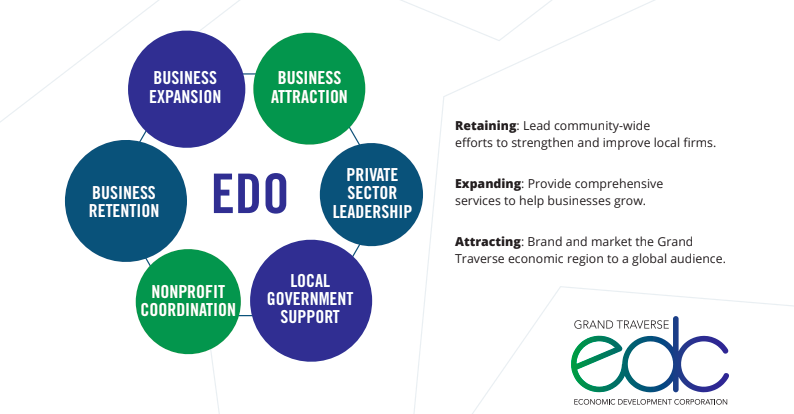 A Traverse City EDO would provide a single point of contact for companies and entrepreneurs considering relocating to or launching in northern Michigan – helping businesses navigate local red tape, identify funding opportunities, and connect with other critical services and infrastructure. The organization would take the reins in leading economic development efforts for the region, coordinating the numerous disparate programs and services underway and working to not only attract new jobs and employers but also retain and expand existing businesses. Call compares the role to being the “quarterback” of economic development in Traverse City. “This is the entity that every day is focused on accomplishing that one specific goal,” says Call. “This is the organization that every day wakes up and says, ‘How do we create more good jobs here?’” Good jobs, Call says, aren't necessarily specific to any one industry but are rather defined as those offering a healthy, livable salary and stable year-round employment. One option being considered by the group is restructuring TraverseCONNECT itself to become the new EDO, or else having the organization house it. The EDO could also be established as its own distinct entity, though both Call and Bulloch believe the next CEO of TraverseCONNECT – an as-yet-unnamed leader who will take over when Doug Luciani leaves in spring 2019 – will be the natural choice to lead the EDO. Bulloch says the TraverseCONNECT board wrote the CEO job description understanding he or she will likely be a key player, if not the actual director, of the project. TraverseCONNECT is accepting applications for its open CEO position through December 5; the board plans to do pre-screenings of applicants through December before moving into interviews in January, winnowing the field to two finalists by early February. Board members hope to have a new CEO in place by March or April. In the meantime, the county and TraverseCONNECT boards are seeking outside help in identifying the best structure and funding mechanism for the new EDO. The group solicited consulting requests-for-proposals (RFPs) from four firms specializing in economic development and EDOs; all four returned offers as of last week, Call says. County and TraverseCONNECT representatives will next meet in December to review the proposals with the goal of hiring a consultant who will provide recommendations by spring of how to best form, govern, staff, and fund an EDO.